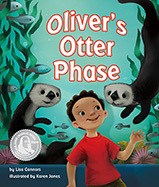 A Spring 2018 release from Arbordale Publishing, Oliver's Otter Phase tells of a boy named Oliver who decides he wants to be a sea otter after seeing them in an aquarium. Oliver tries his best to mimic otter behavior but finds he doesn't quite have what it takes. Throughout the story, kids see what otters eat and do when Oliver tries to act like them. There's also Polaroid picture illustrations that show otters carrying out and performing in their natural ways. 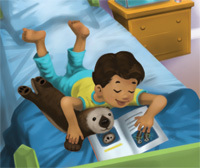 I have to say that Oliver's Otter Phase is at the top of my list of favorite children's books. It tells about otters in an engaging way, and Oliver is a kooky, yet adorable, boy. The illustrations are also appealing. The "For Creative Minds" section after the story has several facts on marine mammals, explains the differences and similarities between humans and otters, explains the differences and similarities between sea otters and river otters, and has a learning experiment on the way that Oliver uses tools as compared to sea otters. 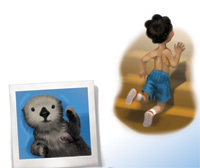 One person will win an Oliver's Otter Phase children's book. I would like to be a dog my sister gets. They are REALLY pampered. Looks like a fun book for the young reader. Thanks. I think I'd like to be a spoiled house cat! Probably a cat in my home because they live so well! I would love to be a horse. Thanks so much for reviewing our book! I had so much fun writing it and thinking like a child again. I would love to be a Parrot. I'd like to be an orangutan. I would like to be an eagle. They are majestic. Plus I would love to be able to fly. a dolphin because they are so smart. like many others stated, an American Eagle, dog (maybe a service animal or one trained to sniff out bad things), or a dolphin as they have been known to rescue those in need. An eagle - cause then I could fly !! I would want to be a cat! I would love to be an eagle. I'd like to be a dog. I'd want to be a bird. "Leave a comment on this blog post with what animal you'd want to be if you were turned into one." I like squirrels, so I'll say a squirrel. I'd want to be a cat so I could sleep all the time. I'd like to be a sea turtle. I would live to be a 🏇! I would want to be an elephant. They have a great family unit. i would be a dog. i love my dog she is my spirit animal. I would want to be a lemur. I really like Turtles. So that would be kind of cool to pull into my shell at night. I would want to be a dog. I would like to be a cat. They get to sit in a window all day and sleep as much as they want. I would love to turn to cat so I can sleep as much as I want. I'd want to be a polar bear, because they are so cute and they play in the snow! I would like to be a wolf. Their pack is like a family and they look after one another. I would love to turn into my dog. She lives a good life!